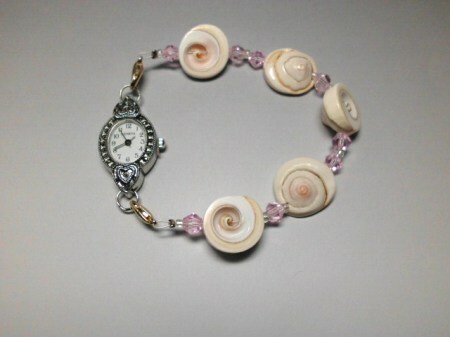 8.25" shell and Swarovski pink bi cone crystal silver Marcasite watch bracelet. Keep the time in style and add a reminder of soft summer days at the beach to your wrist with this natural shell pinwheels, pink Swarovski bi cone crystals and silver Marcasite watch bracelet. Interchangeable with clasps on each end. Change bracelets, not watches. Get a bracelet to compliment or accent each of your favorite outfits.